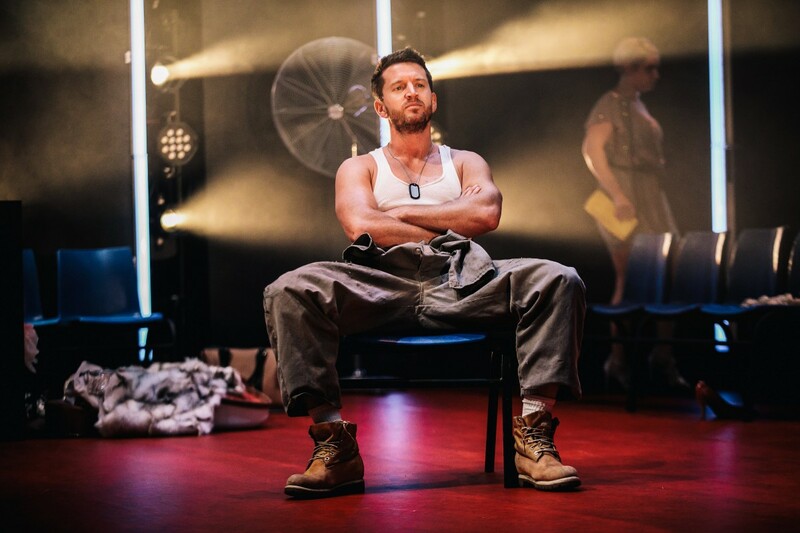 Shane Bosher’s take on Tennessee Williams’ classic A Street Car Named Desire is an emotionally exhausting production (to say the least) that presents confronting and raw performances on a stage colliding with the bubbling tensions of masculinity, sexuality and mental instability. The 70-year-old play is presented with a twist in which modern clothing, modern tech and a bit of Sade accompany a somewhat stark set of blue plastic chairs, a staircase, simple black plinths and a tall standalone showerhead. However, it is the building pressure cooker that is Stanley and Blanche’s tumultuous relationship that really fills the space of the stage at Q Theatre. We are transported to a sweltering New Orleans summer by the shimmering skin and silky accents of the cast. The well to do but penniless Blanche DuBois arrives to stay with her sister Stella, who is shacked up in not so luxurious accommodation with her unrefined and uber masculine husband Stanley Kowalski. The discomfort is immediate in both interaction and location, and she’s soon to find out that her sister is expecting her first child. Blanche is a needy and delicate southern belle whose nerves easily get the better of her which sees her reaching for the liquor regularly. She is dressed impeccably, and I had serious envy for her style, but there’s more to her than initially meets the eye. Stanley, who’s more than put out that his precious Stella now has someone else to give her attentions, is committed to taking down this flirtatious and inconvenient woman who’s infiltrated his castle of which he is most definitely king. The set and sound design add an extra dimension to this highly emotional piece. Bright tubular lights, which also imitate tramlines, illuminate above the actors’ heads. DeBois’ mental decline is mirrored by the dramatic scene changes where music is played imposingly loud while the fluorescent lights flicker. The working shower is powerfully used for two of the most dramatic turning points in the play. Blanche’s fantasies and psychoses manifest themselves on stage, at first subtly, but gradually becoming more prominent. Bosher brings her troubled mind to the forefront of the action, as figures from her past are allowed to impose themselves on to the main stage area. Mia Blake’s Blanche Du Bois is simply divine and watching her go through emotional decline over the course of the play is a mesmerising experience. She cleverly shows the desperation and vulnerability of a woman who’s not having the life she was schooled for, and whose mask is slowly slipping no matter how hard she tries. She is entertaining in her quirks, turn of phrase and amusing mannerisms, however, it is as things take a darker turn where an actor like Blake really comes into her own. She was utterly captivating throughout, with the most disturbing scenes making for a very difficult watch. I found myself having to detach a little by staring at a random shoe on the stage to keep myself together – intense isn’t sufficient. There are some truly haunting sequences that make for unforgettable viewing. Morgana O’Reilly, as Stella, also gets taken through the emotional mill and delivers a great supporting role to Blakes’. She’s equally worthy of praise as she depicts her conflict between husband and sister and her underlying fear of what Stanley may be capable of. Ryan O’Kane takes on this role of Stanely with no holds barred, not to mention having admirable pull up skills. His physical strength is demonstrated early on showing him to be a fit and imposing character who’s physically and mentally dominating. He’s truly terrifying when he needs to be in what must be an extremely challenging character to tap into. His onstage chemistry with both O’Reilly and Blake allows for the power of the play to translate and performing such an iconic character he delivers an individual take on a much satirised, ‘Steeeeellla’ line. I have to say after a very busy week and the upbeat fun of Matilda The Musical the night before, I was a little nervous that I would have it in me to fully engage with such an intense piece of theatre. Despite the longer than average running time (three hours including interval) it was surprisingly easy to get immersed in this production as the performances are so engrossing and the text so tantalising. The final hour of the play is a pretty tough watch. 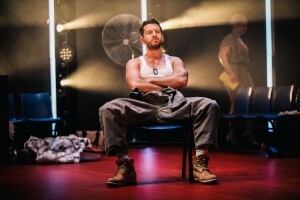 It’s relentless in its confrontation of masculine dominance and Blanches unravelling mental state, but the excellent cast demonstrates just how powerful this play can be. As expected, Silo Theatre delivers a stylish take on a theatrical classic with a killer cast who’ll draw you in and transport you to one of the theatre’s most famous clashes. Silo Theatre’s A Street Car Named Desire is on at Q Theatre until 16 September. PHOTO CREDIT: Andi Crown Photography and Silo Theatre.